–> Live outside the area we normally service, but want a Satori Signature room design plan. –> Desire the polished look of a professionally designed room without the hourly fees. –> Feel overwhelmed by the choice of materials and finishes and don’t know where to start. –> Require assistance figuring out what existing elements stay and which ones need to go. –> Look forward to rolling up your sleeves and having fun implementing the design. –> Need someone to contact for support if you hit roadblocks during the process. You will receive the design plan package approximately 3-4 weeks from the time all required components are submitted. 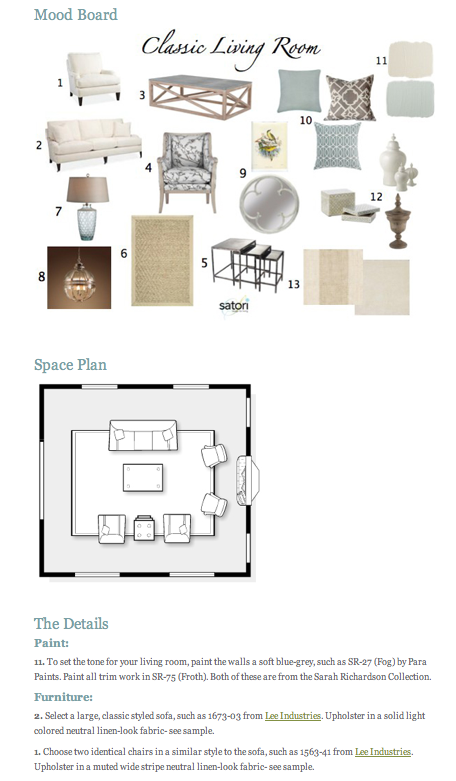 Pictures and measurements of suggested room components, paint and fabric swatches, as well as additional samples. A detailed list of resources and suppliers (local and online), including trade-only if specified (Note: If you are interested in purchasing trade-only furniture and furnishings, or items from stores offering a trade discount, we can make arrangements to purchase items on your behalf and have them delivered to your home. We can discuss trade discount policies at that time. Contact us to let us know which room you are interested in having design plans created for, along with a brief description, and we’ll determine the pricing level. Once you’re on board, we will send you an invoice and you can submit your payment using Paypal or e-transfer. Complete the detailed questionnaire, which will be emailed to you after payment has been received. Email photos, inspiration materials (Pinterest board) and measurements of your room following the simple guidelines we will outline for you. Once payment and information are received, we will begin the design process and will contact you via email along the way to ensure we’re on the same page. It is important for you to regularly respond to emails to ensure your plans are created within the estimated timeframe. After the design plan is complete, a personalized package will be mailed directly to you. Next, we will schedule a ½ hour phone consultation to discuss the plan and answer any additional questions you may have about the room. As an option to the phone call, you can ask questions via email for one week following receipt of plans (average of 1-2 emails per day). Note: Additional support in implementing the E-Design plan is available on an hourly basis. Note: These are approximate guidelines and level of pricing can only be determined after square footage and room details have been considered. Contact us for pricing or if you have any other questions about our E-design Plan. We accept PayPal or e-transfer as method of payment. E-Design requires full payment prior to the start of the design process. Satori Design for Living takes great care to exceed your expectations by providing exceptional service. As a result, we do not provide refunds or exchanges on the purchase of our E-Design Plans. If you only require one, two, three… components of our E-Design Plan, we have à la carte services. All of our packages are customizable to suit your needs. Only have a few questions you need answered? We can set up a time to address everything over the phone or by email. This option is available with a minimum ½ hour charge starting at $40.